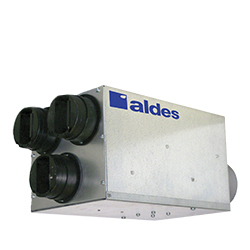 American Aldes Ventergy® Series MPVS100 and MPVS120 Multi-Port Ventilators are highly versatile, continuous-duty fan units for residential and light commercial applications. The MPVS100 meets ENERGY STAR criteria for low-energy consumption. The most popular use is central, continuous exhaust ventilation of bathrooms, kitchens, and laundry rooms. One MPVS fan can ventilate 2-4 spaces. MPVS fans have a compact, in-line design that allows for remote mounting and supremely quiet performance. They have a single exterior exhaust penetration. Accessories are available to accommodate two-to-six bathrooms. Accessories are included only when the fan is orderd as a Ventergy® Series IAQ-MPVS Multi-Port Ventilator Kit. Airflow rates can be automatically set with pre-calibrated Aldes Constant Airflow Regulators (CAR Classic). The passive control element in each duct run infaltes or deflates automatically in response to system pressure to maintain constant airflow. CAR Classics are sold separately or provided with IAQ-MPVS Kits. Note: Certified performance ratings do not account for the effects of accessories or optional balancing dampers.